Connecting people to their own inherent wisdom and place in the wide and wise natural world! I am a classically trained depth psychotherapist with over 30 years experience creatively re-interpreting the work to be more empowering for the client and relevant to today’s issues. I offer psychotherapy for individuals, couples, families and groups, along with consultation and training for professionals interested in learning my particular way of working and meeting the world… or just needing a “check-in” about where they “are”. I offer public workshops and retreats based upon a healing model of ecological presence and participation, as well as experiential processes for groups or companies wanting to improve creativity, productivity and inter-connectivity. In all of my work I strive to bring people closer to the truth of their being and to enliven their lives as they open to the vast interconnected web of life. For those of you who have journeyed with Jan, she has recorded SPIRIT JOURNEY: SHAMANIC JOURNEY DRUMMING AND GUIDANCE. This guided meditation/shamanic journey as well as pure drumming tracks are useful in shamanic journeying or basic, trace-state meditation. 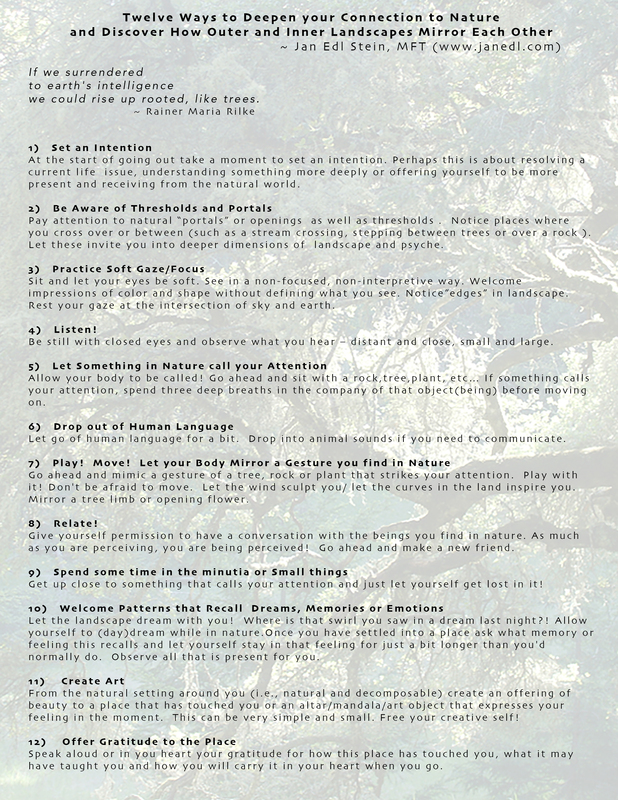 Here are 12 simple, yet possibly profound, practices that you can use to connect more deeply in nature and discover how the inner landscape and outer landscapes mirror each other. Interested in studying with me? Consider joining the Holos 100- hour Certificate Program in Ecopsychology. INTERESTED IN RECEIVING ANNOUNCEMENTS ABOUT RETREATS AND WORKSHOPS THAT I OFFER? And many other gorgeous locations in nature! INTERESTED IN RECEIVING NEWS AND UPDATES ABOUT MY PROGRAMS? Kindly fill out this form to be on my mailing list. I will send you occasional emails announcing upcoming programs.